So, where have you been since Project Genesis? Aharon: Guy released two CDs, For All Mankind as Passenger, a psychedelic Trance CD which included one MFG track (Phonokol), and Emuna (Belief or Faith in Hebrew) with DJ Eyal Yankovich which is a club trance CD (BNE). I didn't write music and worked on my own "Belief" trying to find the meaning of life and my own mission in it. I'm glad to say that I found what I was looking for, but there's still a lot to do about it. A small part of what I understood will appear inside the booklet of our new CD "The Message", which will be released in Israel on the end of this month. What is your musical background? Did you learn music? Play any instruments? Aharon: I learned to play the organ while I was a kid and never stopped playing keyboards ever since, I never played any other instruments but always wrote notes for all kind of instruments I wanted to include in my songs. Guy: I was taking organ lessons when I was 6 years old, and I stopped after 2 years. Then I discovered the world of synth & midi. My first synth (for the Bar-Mizva) was Yamaha CS01!!!. Since then I'm a "midiman". What was your first electronic music experience? Aharon: : I was always into electronic music. I grew on bands like Depeche Mode, Yazoo, Kraftwerk, The Human League and lots of others, and I was always trying to write my own songs but had no instruments. When I met Guy when I was about 15 years old we joined forces and Keyboards and started to write silly poppy electronic music of our own. Guy: Since we met we shared most of our musical experiences, so our musical backgrounds here are pretty much the same. I shared with Aharon his immense musical collection, listening to the same stuff. How did you two meet? Did you always share the enthusiasm with music? Aharon: We met in high school, someone who knew both of us and of our interest in music got us together and we didn't separate ever since. I always collected electronic music records and shared my discoveries with Guy so we always experienced the same enthusiasm and changes in our music interest together. How did you discover trance? When did you decide to make trance? Aharon: After years of listening to electro-industrial music played by bands such as Skinny Puppy, Front Line Assembly, Front 242, Klinik (and others), in 1995 we decided we wanted to write a real electro-industrial album together under the name Message From God. We wrote a few tracks and were sure in our direction. A friend of ours who was very involved in the trance scene was always trying to play us trance music but I couldn't really get into it because it was too melodic and soft for me (Guy didn't really have any problem with it). That was until we heard a couple of tracks by The Infinity Project (T.I.P.) and were amazed by the combination of sophisticated electronic music and melodies. We decided to write a couple of tracks and see what happens, after a few days we were sitting in Phonokol's office playing them the results, an early demo version of our first track Shape the Future and an unreleased track called Crazy. 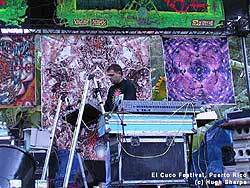 Their music manager, Oren Kristal, heard a potential but didn't really get into our cold monotonic sound (of those tracks) and played us Let There Be Light by Astral Projection so we'll hear his taste of psychedelic trance. We fell in love with this track and with Astral's sound immediately and went back home totally inspired to continue our work. Only a couple of days later we came to see Oren again, he was sure we forgot our keys or something like that, but we came to play him our first psychedelic trance track- Desert Sun. He fell in love with this track right away and signed us to 3 albums on his label. From that day everything moved really fast- a couple of weeks after Shape the Future opened the successful compilation CD Goa Vibes 2 (from Phonokol). Shape the Future & Desert Sun were released as a 12" in the UK on Symbiosis Records. Our first album The Prophecy was released in Israel, the UK and France, and our tracks appeared on lots of compilations all over the world. What is the place of music in your life? Do you have other interests? Aharon: Music was the only interest in my life till I got married to Meirav and had my first little girl Shiran (which by the way means "a happy song"), and now after my search for spiritual meanings I also discovered we are not alone on this planet and that there is a god. So music does keep me busy most of the time but is not my only interest in life. 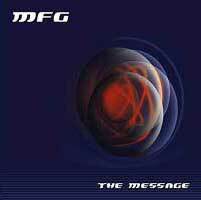 It's funny how we called ourselves MFG (Message From God) before we even knew what the message is, but now it's all cleared. Guy: Music is the main thing for me. But I have my big hobby- I'm really into planes, and I'm really planning to learn to fly planes. The Problem is that in Israel it's hard financially, it's a very expensive hobby- especially if you earn your living as a trance artist. Meanwhile I'm working on my hobby through the computers, and I'm flying simulators for now. There are some really amazing simulators you can get, some used by real pilots as well. How does it work between the two of you- do you have some kind of distributing the work between you? Aharon: Not really, music is a matter of moods, everyone write what he think and feel, and after some editing, cutting and mixing you get a track which is what we both were thinking about (most of the time). Guy Is more responsible on the mixing and I'm more responsible on the editing of the track but it's not a rule, we both say what we think and make final changes before we record the track. How is a track made? What is the process of you music writing? Aharon: Well, most of the time we first need to hear a good kick drum and an interesting bass line in order to start a track. But it can also work so that someone writes an interesting lead or something like that, then we try to find lines and sound effects that will match and will become a part of the background. Most of the trance musicians work on the same first few sequences in a loop and write everything there. Then they copy the parts of music and just edit (mute and cut) till the track reaches its end. We work differently in most of the cases, we just copy the background and write everything as in a story, that is why you can hear lots of changes and different ideas in our tracks. Can you share with us your studio equipment? Tell us about the upcoming album? A lot of people waited a long time for this one, what should they expect? Aharon: The best from MFG, it combines everything you ever liked in our music from old style (in new sound) to new interesting directions. Guy: It's an MFG CD, but this time it's friendlier comparing to Project Genesis. It's very diverse, and we checked some new directions and dark night track, an ambient track. Even the responses I got from people who are not trancers were really good- they liked it musically. I think it's more suitable for home listening comparing to our previous releases, though it'll works just as well in parties. Did you get a chance to play it in parties? What was the feedback? Aharon: I only played it once in Jerusalem a couple of weeks ago and the feedback was great. Do you follow what has been going on the trance scene? A lot of people started making club-trance, a lot of trance releases in Europe go back to the roots, back to Industrial-techno sounds- how do you place your new album in this? Aharon: We never really cared about what others do, we have our own development, ideas and wants. We played some of the new tracks to some famous DJs and they were amazed how can we be so updated while we are not really involved with everything that happens and the changes that happened in the trance scene. Well, I have no idea myself but I'm sure people will like this album and hope this is the exact album everyone was waiting for with the right sound and in the right time. Guy: I don't really listen to trance a lot, the stuff I got to hear in trance lately didn't excite me, things sound too much the same. Aharon: I guess it depends on its success, if people will like it and will ask for more, we are ready to give more, and even if not, then I'm sure you will still hear us but maybe in different styles of music. Guy: It really depends on how this album will sell, if we feel that we still have a crowd out there that is interesting in hearing more MFG will go on doing it. If not, maybe we'll turn to other directions in electronic music. How do you feel your music have changed since the first album (musically, sound-wise etc.)? Aharon: I think our music changed a lot and still changes, we have more equipment and get more experienced in sound work everyday. It seems that you don't play at parties a lot, though the times I saw you play together were always great- why is that so? Do you prefer the studio to playing in parties? Can we expect some kind of a tour with the new material? Aharon: We like to play in parties around the world but not really in Israel because the police thinks the artists are drug dealers while we don't use them at all… We sure hope to tour around with our new album, it mostly depends on party organizers, if they want to book us or not. At home, do you listen to trance at all? What do you listen to besides trance? Any recommended stuff you've listened to lately? Aharon: The only place I listen to trance is in the studio when I work (sorry). These days I mostly listen to mysterious early electronic releases from all over the world released in the late 70's and the early 80's, if you want to know what I'm talking about (for a local example) search for an early record by the Israeli band Intensive Care Unit. Do you have interest in making other kinds of electronic music? Guy: If I had the money I would love to write and make electronic music with a real orchestra. More realistically I believe our next project will still be MFG but maybe less trance and more different music. Aharon: I believe in our new album and hope it will get us to tour around the globe. If it will happen I guess we will start to work on our next album soon, we think about a "best-of" compilation CD of MFG with some new tracks and remixes to some of our old tracks. We will keep you updated. Thanks guys, and good luck with the new album!